We’re less than a week away from the October 4 launch of the Pixel 2 and Pixel 2 XL, but it doesn’t look like there will be too many surprises when they land, as a big leak has just revealed most of the specs. Supposedly the Pixel 2 XL will have a curved QHD screen with a screen-to-body ratio of 80-85%, meaning minimal bezel. It’s tipped to use a high-end Snapdragon 835 chipset (the same chip as powers the likes of the HTC U11 and some versions of the Samsung Galaxy Note 8) which would make it one of the most powerful handsets on the market. The Pixel 2 XL will also apparently come with either 64GB or 128GB of storage and dual-stereo speakers, but no headphone port. The source adds that the phone will have a single-lens rear camera with optical image stabilization (OIS), and there’s a suggestion that the front might have OIS too, but they don’t seem clear on that. Interestingly, it’s also said to have an E-SIM slot, which could let you switch networks without switching SIM cards - but that would be a bold move. The Pixel 2 XL will also apparently have a fingerprint scanner and be IP67 certified dust and water resistant, meaning you can submerge it up to 1 meter deep for 30 minutes. There rumor states the screen will be made of tough Gorilla Glass 5, a big 3,520mAh battery and the long-rumored Active Edge feature, allowing you to squeeze the phone to launch Google Assistant or mute calls and alarms. 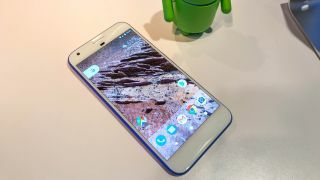 The standard Pixel 2 meanwhile is said to be similar, but with a smaller 1080p rather than QHD screen, and the display will likely be flat rather than curved. It will also apparently have a smaller 2,700mAh battery. Finally, the source said that purchasing either of these phones will give you unlimited Google Cloud storage until 2023. While we’re skeptical of the E-SIM, the rest of this information sounds believable, and largely lines up with earlier rumors. Android Authority, which received the information, also sounds convinced by it, claiming to have verified it independently using an internal document. We’ll know for certain how accurate it is soon, and we’ll be sure to bring you all the information on the Pixel 2 and our impressions of it as soon as it’s announced. Will the Pixel 2 be able to compete with the iPhone X?